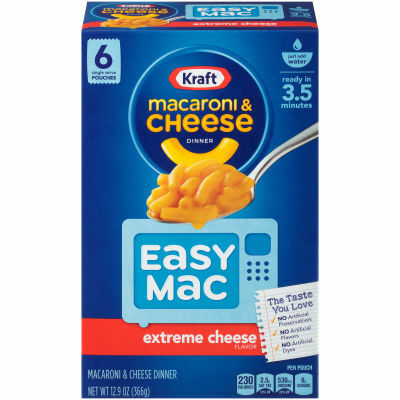 Kraft Easy Mac Extreme Cheeses Macaroni and Cheese DinnerGet ready to drown into a mighty pool of cheese and cream with Kraft Easy Mac Extreme Cheese Macaroni and Cheese Dinner; dipped in extravagant cheesy sauce. Crafted with care from USA for the people who are in love with extra cheese. Once you start eating, you will not be able to resist this thick and cheezy meal.Love at First Cheesy Yummy BiteIt's rich in taste with velvety cream and lip-licking cheese to appease your undying cravings for a cheesy - creamy bite. The pleasing fragrance in the air will magnetize you to your seat until you gobble up every last portion. So what are you waiting for? Grab a box and satisfy your cravings now! Serving size 1 Pouch (61g).